A friend of mine gave us a small silver bowl for as a wedding gift. I haven’t got it valued, but I’m certain it costs a lot with silver prices being what they are. She explained to me that their family tradition was to give wedding gifts of land, gold or silver. The idea was that the value of these gifts would increase in time and if the couple faced hard times they could sell these off and use the money for themselves. José suggested I should ask her for a couple of plots of land too! Wealth and our perception of what it means to each of us is always fascinating. 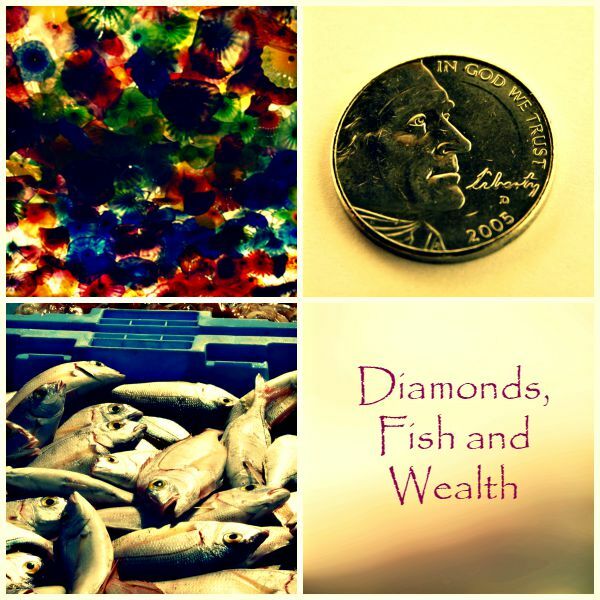 You must wonder what the connection is between diamonds fish and wealth. Let me tell you a story I read a while back. Okay, so this is my version of it. A man heard of a far away place, to which one had to travel with great difficulty, where diamonds were as plentiful as the dust. All you had to do is stoop down and fill your pockets with them. So selling all he had, he undertook a difficult voyage to reach the ‘Land Of Diamonds’. Imagine his excitement, when he saw that the stories were indeed true. The man filled his pockets and bags with large quantities of diamonds. He was so busy doing this that he didn’t notice the curious looks that passersby gave him and that the local children stopped to watch his activity. Before undertaking another difficult journey back home, he decided to have a good meal in an expensive restaurant. At the end of the meal, he took out a small diamond to tip the waiter, who sneered at him. The locals considered these ‘pebbles’ to be worthless. In this ‘Land of Diamonds’ the currency that was sought after was fish! The man soon found himself washing dishes to pay for his meal. Our hero was an enterprising man. He stayed on, worked hard and began to invest in fish. Soon he became stinking rich (quite literally too) with large godowns of rancid fish. Now that he was wealthy, he decided to head home. He loaded a ship with all the fish he could and started on his journey. You can only imagine what happened when he reached home. People laughed at this self-proclaimed wealthy man with a ship load of rancid fish! We can laugh at the foolishness of this person, but which of us hasn’t made a bad investment or two. We work hard, earn money and hope that we can make it grow, but we don’t always know what a good investment really is. There are a lot of self-proclaimed experts who tell us that real estate is the best investment. But we know that sometimes a political or economic change can see real estate prices fall dramatically. Gold, until a few years ago, was the best investment. Not any more. Still others tell us that equity is the way to go, but we don’t know how the market works. Fixed deposits, mutual funds, bonds… The list goes on. But we’re not experts, are we? I’m of the opinion, that in matters of personal finance, that we must seek the advice of experts and be willing to pay for their services. These are people who have studied investments and finance for years. They know how the markets work, how to invest prudently to make a profit. They educate themselves on the the global scenario and are also familiar with investment opportunities in India. There are a lot of personal finance professionals that you can find to manage your investments. Do your due diligence and find a company or an individual that will help you grow your wealth wisely. I’m linking into Write Tribe’s #MondayMusings today. Great wedding gift and great story! Oh real estate, if only the thought you could never loose money in land or real estate was true! I think financial advisers are great but the key is he/she must hear your needs and you must hear their advice and then make your own decisions. Thanks, Haralee! Real estate is a big draw here too! Not that anyone will openly admit that they made a mistake! 😉 Yes, a good financial planner is really like a good doctor – who listens and prescribes appropriately! Great story, Corinne! We’ve been burned by bad investments before and agree that it’s better to seek professional advice. Your friend’s wedding gift was so generous. Italians give money instead, which I think is a great idea. Corinne, I am quite cynical about the advice given by so-called professionals. First, they pay attention to only the wealthy clients. Second, they often give you advice suited to their interests and not yours. Third, attrition is so high these days, managers keep changing. In such a climate, one needs to learn enough of investment options and how they work to really make sound investments. Lata, I get you! While it’s best to learn on your own, not every one has the aptitude or the time. I guess we have to learn enough to know when someone is pushing you towards something you are not comfortable with. I loved reading this story. Does get the brain cells going. I agree that it’s always wise to seek expert advice. Glad you liked it, Julia. Yes, we must ensure we get timely and good advice. The meaning and value of wealth changes with people and region. I liked the story, Corinne. You’re so right, Vinitha. Culture plays a big role. Wealthy is the one who has solace, who feels happy inside. Fish and diamonds have nothing to do with wealth but money has its own role especially for Indian weddings! Yes, Indian wedding is an experience in itself even if it is not so extravagant. I love your parable, Corinne! and PS: someone can give me either diamonds OR fish, I love them both! The story is indeed intriguing.. we all should ponder over this fact.. wealth and personal finances.. Gold, land, etc etc, are assets which give positive returns for sure in the long run.. in case one wants to invest and rest.. and there are other instruments as well.. But the message that you are trying to convey here is perfect.. I loved the idea..
That’s an interesting story.Being rich doesnt always mean having money, It means being happy with what you have. And I liked your friend’s philosophy of gifting only land, gold and silver! We all can do with friends like her 😀 Agree, for finances, it is better to consult the experts. Very intriguing story with a great message. Investments can go bad and I like that you recommend seeking advice from a professional. Well written and a very good topic! Yes, indeed Corinne. The experts know best. A nice story with a moral. Rich is the one who truly understands the value of what she/he has. What’s wealth for one, isn’t so for another. I agree, Corrine. In matters of personal finance, wealth experts are the key! PS: For some reason the link you’ve given doesn’t lead to your blog. Would love to know more about wedding gifts and the reasons behind them, Naba. Great fodder for a post, no? Great story. Your friends’ choice of wedding gifts goes far beyond wedding registries, which I’m always happy to use, but theirs is much better. I agree with your thoughts of seeking expert advice and would add that God provides for those who have been generous with others in their time of need. Yes, wedding registeries haven’t caught on in India, Dorothy. It’s considered rude to ask for what you want. Also, when we invite people for weddings we have huge buffets and don’t ask people to select in advance what they will eat. Weddings are usually extravagant here, to say the least! I so believe in your philosophy of generosity being blessed! Those things used to be considered rude here, too. I sometimes feel sad for the coarsening of American culture. Consideration and good manners are being flung aside in favor of self-seeking. However, I’m also sometimes heartened when I encounter thoughtful young people. Maybe all is not lost. I think it would be fun to attend a wedding in your country. I think it’s the same all over, Dorothy. I believe that extravagance is also a sign of coarseness! I was so happy to read some stories of young couples who opted to feed the poor, serving food themselves, instead of having a wedding reception.